Properties in Terroba average 4.9 out of 5 stars. Property 1: "La Prensa" A privileged place where the culture of wine is sipped. Casa Mirador de Mateo for lovers of nature and animals. Property 4: Casa Mirador de Mateo for lovers of nature and animals. Property 6: Cottage to 7 km. From Logroño to enjoy family Rioja. Fantastic rural house "Los Arcos de Yanguas"
Property 17: Fantastic rural house "Los Arcos de Yanguas"
Property 23: Apartment with unbeatable views! APARTMENT BELLAVISTA, pool, terrace and WIFI. 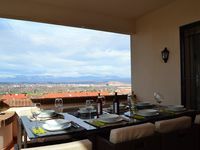 Property 29: APARTMENT BELLAVISTA, pool, terrace and WIFI. This was a wonderful choice for us. The house is big and well-maintained. It is on a beautiful piece of land with incredible views. The proximity to a large city with great restaurants was a bonus. The pool is beautiful. We were close to all the wineries and took full advantage of that. Elena and her family could not have been nicer. The house was perfect.